Tuesday 1st NEW YEARS DAY - Happy New Year and all the best for 2019 recruits! Sniper Bootcamps are based upon performing your choice of any of our 1-HOUR military inspired, educational, motivational and structured bootcamp sessions aka 'operations' or S.W.A.T (Studio Workouts to Assist training) classes each week. 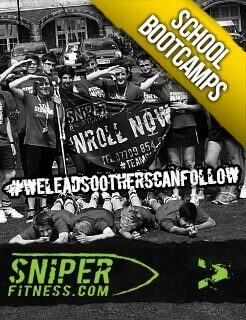 Whether you are male or female, young (16 yrs+) or in your prime, fit or not as fit as you like, Sniper Bootcamps are perfect for you to achieve your fitness aspirations! Each day... Monday to Saturday enjoy a different Sniper bootcamp operation or S.W.A.T class provided by your very own Drill Sergeant. Simply choose your location, then enjoy the choice of ANY of our bootcamp options in that area, selecting the days and times that are most convenient for your lifestyle. 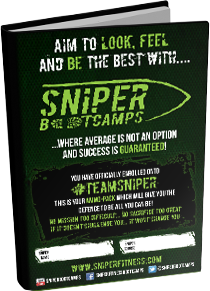 You can enrol to a Sniper Bootcamp or enjoy a FREE 7-DAY trial at ANY POINT in the month... so start your fitness journey with #teamsniper today. Below you will see what days/bootcamps/classes are available at each location. For full intel please see our BOOTCAMP/CLASS SCHEDULE where you can select the LOCATION to show specific bootcamps in an area - click here. IMPORTANT INTEL FOR WHITBY: Please note that our Whitby regiment has extra monthly membership options available including 1x weekly, 2x weekly and 3x weekly, monthly membership options and where the maximum class entitlement allows for 12-15 bootcamps per month. - 4:00pm Tuesday & Thursday after the school pick up and early enough to make sure they are not late for 'lights out,' ...children will be welcome to attend a our parent and child bootcamp... SNIPER SCHOOL'S OUT BOOTCAMPS for FREE (must be 15 years old or younger). For full intel and rules regarding this class please click here. - Only for NEW recruits... enjoy a FREE 7-DAY bootcamp in a location/day/time of your choice. To enrol, simply click the 'enrol' link on this page, follow the on screen instructions and when it asks you to select a 'location' please select 'Sniper FREE 7-DAY trial bootcamp. 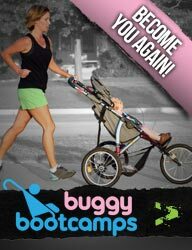 PLEASE NOTE: Pushchairs are only permitted on Buggy/Mid-morning and School's Out bootcamps. However, taking a pushchair to a Buggy bootcamp is not necessary, but please be aware that a Buggy bootcamp will include babies/pushchairs. Once you have enroled, simply use your desk-top computer, tablet, mobile or download our app to select the DAYS and TIMES of the bootcamps/S.W.A.T classes you wish to book throughout the month. Your MONTHLY membership entitlement will only start from the date you book your FIRST CLASS. 1-months worth of structured, creative, enjoyable and challenging workouts with a different 'operation' provide each day, Monday to Saturday. After your first month, earn credit for every month you participate in Sniper Bootcamps and redeem for FREE APPAREL... fancy a new hoodie, leggings or cap... get one for FREE. Please note, Whitby once or twice weekly Bootcamps do not earn credits. FREE Bootcamp body composition measurements including: weight, fat %, BMI, muscle %, visceral fat, RMR, BMR, bone mass, water weight and circumferences - this is NOT compulsory and is the recruits choice!. Monthly Top Sniper awards and refreshments... we buy! Most importantly... REAL RESULTS FOR YOU!!! Become part of #Teamsniper for life and be driven by an army of like minded individuals all with the same mission; to transform their lifestyles and become the best they can be. 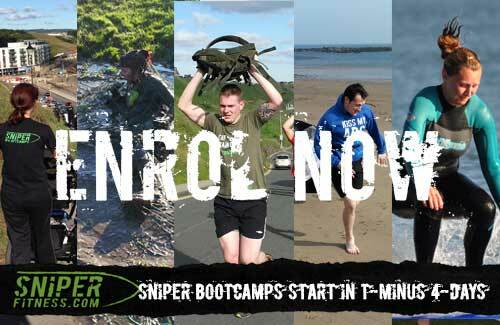 A 5% discount on all initial consultations with Neil Corcoran Osteopathy for recruits taking part on a Sniper Bootcamp. All NHS staff receive 10% OFF our Scarborough and Filey bootcamps with discount code NHS10. Simply add the code when asked at the checkout. 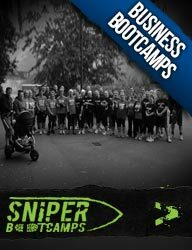 Refer a friend and receive a 20% discount code towards your next Sniper Bootcamp. Simple ask the new recruit to contact us stating which Sniper recruit they were referred by. A discount code will then be sent to the referring recruit. All Sniper recruits receive 15% OFF Prepped4life meals with discount code SNIPER15. Simply add the code when asked at the checkout. 1. Select your bootcamp location and payment. 2. New recruits will then be asked to create their account. 3. Payment and promotional codes added. 4. Bootcamps in the location you have paid for can then be booked via your desktop computer. 5. A welcome email/text with a link to our free mobile app will be sent. 6. Email/text confirmations will then be automatically provided for all bookings and cancellations. 7. New recruits will be contacted by a Drill Sergeant with-in 24-hours to book their one-to-one, answer any questions and to confirm the location of the meeting place for their first bootcamp. Each week you will be entitled to select (via your mobile, tablet or desktop) your choice of any of our Sniper bootcamp days/times, aka operations, or S.W.A.T classes. Our 24-hour booking policy means that if a bootcamp/S.W.A.T class is scheduled to begin within 24-hours, that bootcamp/class is LOCKED and no one else can book on or cancel at that point. When using your app a locked bootcamp/class will state 'CALL.' If you want to find out if there is any last minute availability for a locked bootcamp/class, then please just call ourselves for the latest intel. 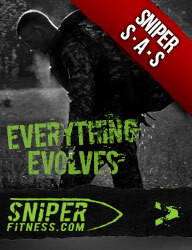 If you are new to Sniper enjoy a FREE 7-DAY trial Sniper Bootcamp session on us...ANY TIME and on ANY DAY! We understand that the hardest part of changing your lifestyle is getting started. It can be scary, especially if you are on your own... but as we say... "every journey begins with a single step" and you will never feel alone in the ranks of #teamsniper. 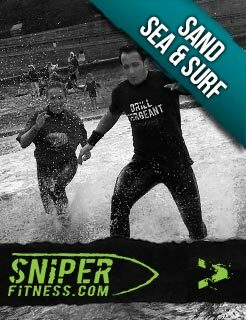 So to make that initial step on your own fitness journey that bit easier, we are providing a FREE 7-DAY Sniper Bootcamp to anyone that is new to #teamsniper. Try before you buy... or as we say... enrol! Sniper bootcamps, aka 'operations' use a mixture of short jogs/runs/movement patterns, body weight, plyometric and isometric based exercises where the variables of duration, speed and time under tension are constantly varied to provide different levels of exercise intensity and in doing so keep your body constantly adapting to the workouts provided. As Sniper operations are based in the great outdoors we look towards using the environment itself to provide a platform and base to perform our branded operations... hills, banks, walls, bars, benches, sand, grass, steps, slopes... all are utilsed at some point to create a diverse and creative operation in order to allow you to achieve the best possible results in the shortest amount of time. Whats more, because we do not use apparatus based exercise and utilise only what nature and the environment has provided, ALL our Sniper operations can be taken away and performed by you on your own... at home, work or even... on holiday! FOR THE FASTEST AND MOST CONVENIENT WAY TO SCHEDULE YOUR BOOTCAMPS PLEASE USE OUR FREE APP! A LINK TO OUR FREE MOBILE APP IS PROVIDED IN YOUR ENROLMENT EMAIL/TEXT. IMPORTANT: PLEASE MAKE SURE YOU LOGIN TO THE APP USING THE SAME EMAIL WHICH YOU USED TO CREATE YOUR PROFILE. Our FREE mobile app will allow you to conveniently BOOK, CANCEL or RESCHEDULE the bootcamps of your choice. Once you have downloaded the app simply follow the on screen instructions and you will never need a computer again! WHAT IS A SNIPER AMMO PACK? Once you have enrolled onto #Teamsniper you will next be contacted by a Sniper Drill Sergeant within 24-hours in order to book a convenient time (15-mins only is required) for your own one-to-one prior to the start of your bootcamp, where all questions or queries will be answered and further intel about your bootcamp will be provided. PLEASE NOTE: All the above measurements are NOT compulsory and is the recruits choice if they want to have the measurements taken. The information we gather will allow us to present (email) you your own editable Sniper Nutritional Ammo Pack! In order to allow us to use our bioscales please download the FREE ACTIV8RLIVES smartphone app by clicking here. How often do you start a diet or a new eating plan without actually understanding WHY it will help you lose weight? Well not any more, the Sniper Nutritional Ammo Pack will give you information as to why our diet advice will work. If followed through correctly, and by using your own Calorie Calculation it will be easy for you to pick which meal choices are going to get you to your target weight. We at Sniper believe in providing advice and information that can be sustained for the future. No quick fixes, no crash diet, magic pills or potions... just good honest advice... along with good honest food choices. Yes, you can have your cake and eat it too! No recruit goes into battle without the right rations to fuel their fight. 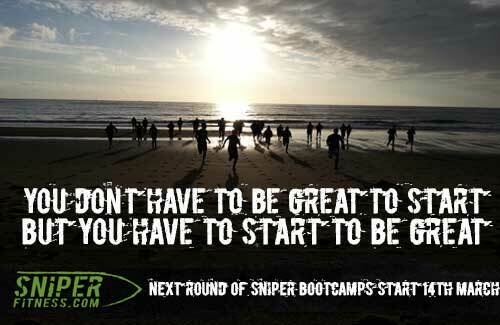 "Eat Clean, Train Dirty"... use your FREE Ammo Pack and aim to look, feel and be the best with Sniper Bootcamps! Become part of #Teamsniper and gain motivation, focus and support from our social media army of like minded individuals, who all inspire, help and educate each other to transform their lifestyles for the better. 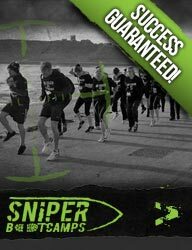 Follow Sniper Fitness Bootcamps on either our Facebook or Twitter pages and share your own intel and encouragement to other recruits to help them hit their own fitness targets. There is strength in numbers and together we will hit every target we set ourselves... be part of #Teamsniper.